NEW highly polished 1” thick polished steel plate for superior heat distribution, fast recovery and energy efficient operation. Manual control with standing pilot for the budget-minded operator and experienced chefs who prefer the “feel” of a manual control. Available in 15″, 24″, 36″ and 48″ widths to meet your space and volume requirements. 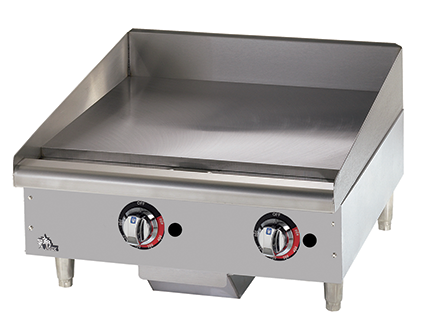 Star-Max® chrome griddles feature a hard chrome surface to provide superior cooking performance and even heat distribution. Highly polished smooth surface reflects heat inward reduc ing radiant heat, lowers energy cost up to 30% and keeps the kitchen cooler. The non-porous chrome surface eliminates food taste transfer and can be cleaned quickly, reducing labor cost. Highly polished 1” thick steel plate for superior heat distribution, fast recovery and energy efficient operation. NEW longer lasting, heavy-duty metal knobs. Double wall construction and enclosed bottom helps reduce heat loss. 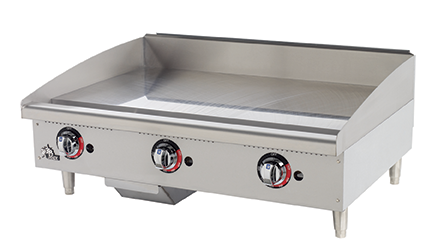 Cool-to-the-touch stainless steel bull nose front provides knob protection and comfortable work zone. 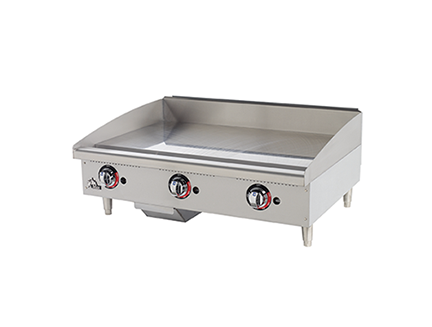 NEW custom designed 28,300 BTU aluminized steel U-shaped burner every 12” of cooking surface provide even heat distribution. Heavy-duty body construction with stainless steel front, bull nose and 4-1/2” high tapered splash guard. Spatula wide 3-1/4″ front grease trough and grease chute for easier cleaning. 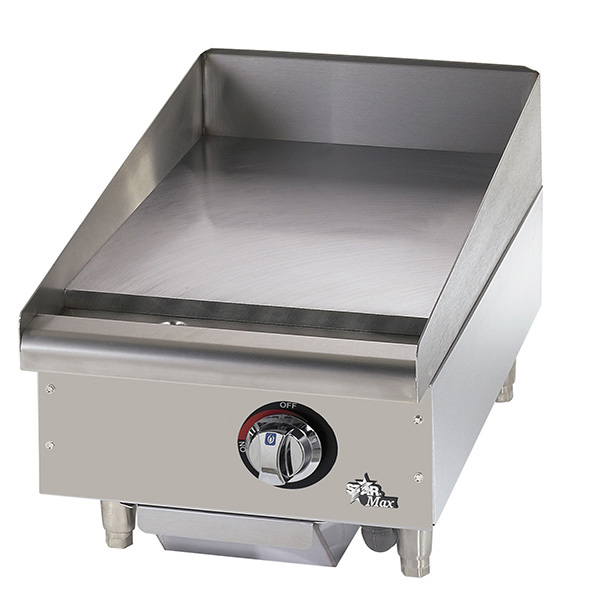 Large 4-1/2 quart stainless steel grease drawer. Gas convertible in the field with conversion kit supplied. Units are shipped Natural Gas. 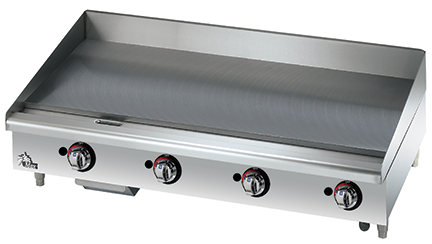 Heavy-duty 4″ adjustable legs to fit your countertop line-up requirements.